When AR Emoji launched, we noted the augmented reality solution was extremely lacking compared to Apple's Animoji, which was much better at accurately portraying facial expressions and emotions. It was obvious that Samsung was trying to one-up iPhone X, and as usual the results were mixed at best. Still, AR Emoji does offer enhancements over Animoji, the main draw being character customization. 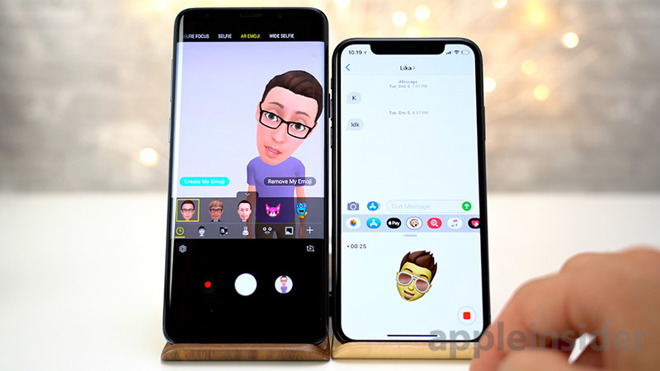 That will change once Memoji hits the scene, so we decided to take an early look at the technology as presented in Apple's first iOS 12 beta release. 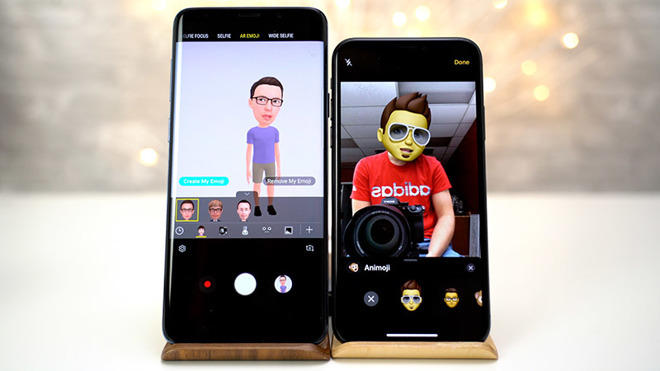 In iOS, Animoji and Memoji live within the Messages app, whereas Samsung places AR Emoji in the Galaxy S9's camera app. A seemingly minor difference, Apple's placement puts an emphasis on sharing the AR assets with friends or using them in Messages-based communications, as evidenced during an onstage demonstration at the WWDC keynote on Monday. 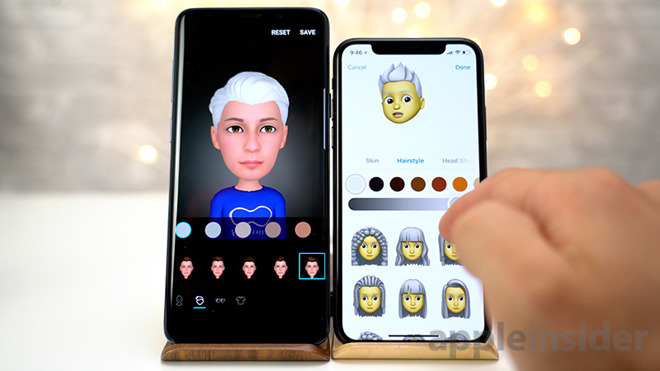 Starting with emoji creation, AR Emoji takes a picture of a user's face before it begins the process, whereas Memoji launches with a blank slate. The S9+ uses this photographic information to automatically apply facial features to a basic emoji. 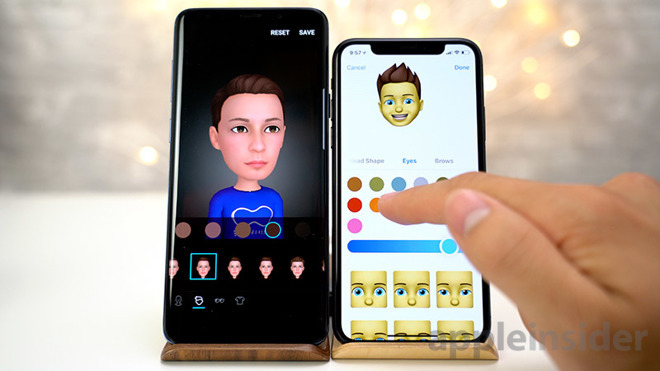 Notice that the Memoji character is live during the creation process, compared to AR Emoji, which replays the same basic animation. This helps with customization. Samsung's solution requires users to spin the emoji with their finger, while iPhone X users can simply turn their head to view all aspects of their work in progress. A simple slider is used to change skin tone in both systems, but Samsung doesn't allow much range in the darker spectrum of colors. Memoji, on the other hand, has a massive amount of skin colors to choose from, even blue and purple. There's also an adjustment slider for each color in iOS. Let's move onto hairstyles. AR Emoji offers a ton of hair colors, but they aren't applied to your eyebrows, which could be a good thing. Memoji offers a slew of hairstyles, but one drawback is that female and male options are mixed together. With the adjustment slider, users can change the brightness or depth of each hair color, and the eyebrows change as well. An extended color pallet provides more unique colors like blue and pink. Going through all of AR Emoji's hairstyles, we couldn't find any that matched our appearance. The hair animation doesn't move side to side like Memoji does, so you'll have to spin the character around. On top of that, Memoji hairstyles have ragdoll effects for your hair, flowing back and forth as you move your head around. And it's not just a basic effect, each hairstyle moves differently, like this one, or this mohawk that bounces side to side. Head shape options for Memoji start with age, from a small child to an adult and finally to an older man, which just adds wrinkles under the eyes and around the mouth. There are a ton of chin options, with the UI showing rows of different shapes. Moving on to eyes, Memoji allows shape customization, while AR Emoji locks users into the eye shape assigned from the setup photo. Memoji also includes a bunch of eyelash options and you can even change your eye color, complete with yet another slider. Unfortunately, you can't change your eye color with Samsung's AR Emoji. Eyebrows offer a similar user experience on Apple's avatar creation software, represented by rows of different brow styles. Nose, lip and ear options are more simplified, as Apple chose to keep customization limited. Facial hair is another detail that Apple nails. AR Emoji lacks the ability to change this feature, though it does add some two-dimensional shading if you're sporting a beard or some stubble. 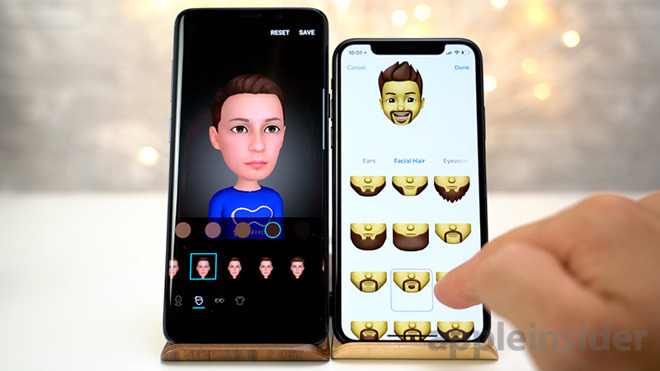 Memoji also lets users add sideburns, which line up perfectly with each different beard option. Eyewear is also much more detailed in Memoji, with frames dropping a shadow on the avatar's face allowing them to stand out. Apple lets users change glasses color as well as lens tint, so you can completely block out the eyes behind them. Finally, Memoji includes accessories like hats and earrings . There's a bunch to choose from, and there's lots of color options as well. AR Emoji, on the other hand, offers outfit options, but there are few to choose from. One main difference between the two systems is full body representation on AR Emoji. Memoji is limited to a user's head. More importantly, facial tracking on Apple's Memoji is much better, with a higher degree of accuracy that results in more realistic animations. The body on AR Emoji swings back and forth when you move your head side to side, almost like you're hanging from your head, definitely not intentional. Smiles look quite creepy on AR Emoji compared to a very expressive and natural smile on Memoji. Apple added tongue detection in iOS 12, a feature that also works with the company's preset Animoji characters. AR Emoji does a better job at tracking eye blinks, but Memoji puts it to shame when capturing winks. Both systems do a pretty job job of tracking your lips. The iPhone X can also actually track your eyes as they go side to side, and even when you're rolling them. The S9+ cannot detect eye position at all. As far as avatar animations go, Apple's Memoji does a great job at portraying a range of different emotions, from sad, to neutral, to happy. You can easily take a picture or video on the Samsung, but on the iPhone X, just tap the Memoji to freeze the frame, then you'll be able to send it. With AR Emoji, you're not limited to the Messages app like you are on the iPhone X. You can send it pretty much anywhere you want. Perhaps the coolest thing about Memoji is that you can use it when you access the camera within the Messages app. Just tap this new Star Icon. Now, when you select your Memoji or Animoji, it gets applied over your head, and the tracking is incredibly smooth. Filters can be applied to entire image, including the Memoji. There's also stickers that you can add to it, and they'll move around with your face as you move.